Starring: Ewan McGregor Jim Cummings Hayley Atwell Chris O’Dowd Brad Garrett Toby Jones Nick Mohammed Peter Capaldi Sophie Okonedo. Production Company: Walt Disney Pictures. Kent Locations Used: Port of Dover Cruise Terminal One (Dover Marine Station), Shakespeare beach. In this feature by Disney Studios, AA Milne’s Christopher Robin (Ewan McGregor), is a working man with a wife and family, who is helped by his childhood friends, Pooh (Jim Cummings) and Co. to rediscover the joy of living. Over a period of four weeks, production transformed the entire historic Grade II Listed Dover Marine Station, an old Victorian railway station at the Dover Cruise Terminal into a London railway station, including running trains. A short film for the end credits was also shot on Shakespeare Beach in Dover. 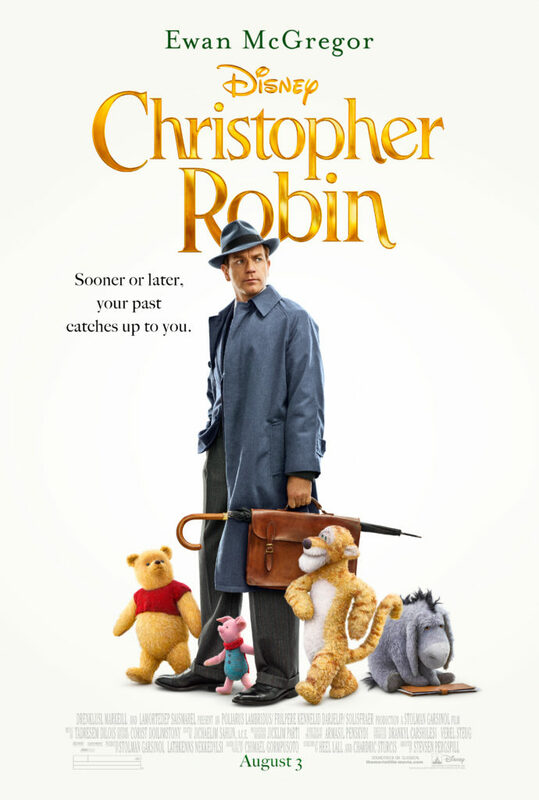 Starring Ewan McGregor (Moulin Rouge, Trainspotting) as Christopher Robin, Jim Cummings (Princess and the Frog, Shrek) as the voices of Winnie the Pooh and Tigger, Hayley Atwell (Captain America, Cinderella) as Robin’s wife Evelyn Brad Garrett as Eeyore, Toby Jones (Tinker Tailor Soldier Spy, The Mist) as Owl, Nick Mohammed (The Martian, Bridget Jones’s Baby) voices Piglet, Peter Capaldi (Doctor Who, World War Z) as Rabbit and Sophie Okonedo (Hotel Rwanda, Dirty Pretty Things) as Kanga. The Railway Station at Dover Western Docks was first opened in January 1915, to receive wounded soldiers during WWI via the newly built Dover Harbour in 1909 and dispatched them to hospitals across the UK with best possible speed. The Unknown Warrior was returned to Britain here before being laid to rest in Westminster Abbey. From 1919, the station served the civilian population wishing to take the Express Boat Train to the Continent, though during WWII, it once again served the military. After its closure in 1994, it has served as Dover Cruise Terminal 1 which opened in 1996. Production for Christopher Robin in Dover started in September 2017 and the listed and fully intact station building of Cruise Terminal 1, was transformed back into a railway station, complete with trains, shops and almost 400 local extras providing the background of a busy London terminal for a few days. Cruise passengers were diverted to Terminal 2, which gave production unusual, sole use of a large station set. Port of Dover PR & Media Relations Officer, Justine Wingate said: “Dover Marine Station here at the Port of Dover, is a unique and versatile location. Not just because it is a beautiful example of a Victorian railway station but it is situated in a large secure area with little public access and plenty of space for unit bases and equipment. Kent Film Officer, Gabrielle Lindemann said: “Once the location was secured, the biggest challenge was to accommodate the sometimes additional two to three hundred crew and cast. Local businesses stepped up to provide additional unit support and Kent accommodation providers across the whole of East Kent hosted our visitors. Dover houses Europe’s busiest ferry port, connecting the UK with the European mainland. Dover Castle towers above the town, signalling Dover’s strategic importance in the defence of the country and the White Cliffs are one of the most recognised landmarks in Britain. Some other feature films shot around Dover are ‘King Lear’, ‘Avengers’, ‘Into the Woods’, and ‘The Ones Below’. The film will be released in the UK on 17th August 2018.